Cuba, the Violet Isle—a name known to few for the rich color of its fertile soil, is an island that has captivated the imagination of the world through a tumultuous history that has played a significant role in the political machinations of the twentieth century. It is a land has emerged in the twenty-first century as a complex nation coming to terms with a fate that is yet unforeseen. As we reflect upon the country’s future, we may look to its recent past, to its people and its landscape. Over the course of 15 years, photographers Alex Webb and Rebecca Norris Webb made 11 trips to the Violet Isle, each of them documenting different corners of the country. While Alex Webb focused on the country’s street life, Rebecca Norris Webb turned her attention to the displays of animal life, exploring tiny zoos, pigeon societies, and personal menageries. Together, they published Violet Isle in 2009 with Radius Books and while the book has since sold out and gone out of print, they continue to share the work in exhibitions around the world. Photo: Sancti Spiritus, Cuba, 1993. 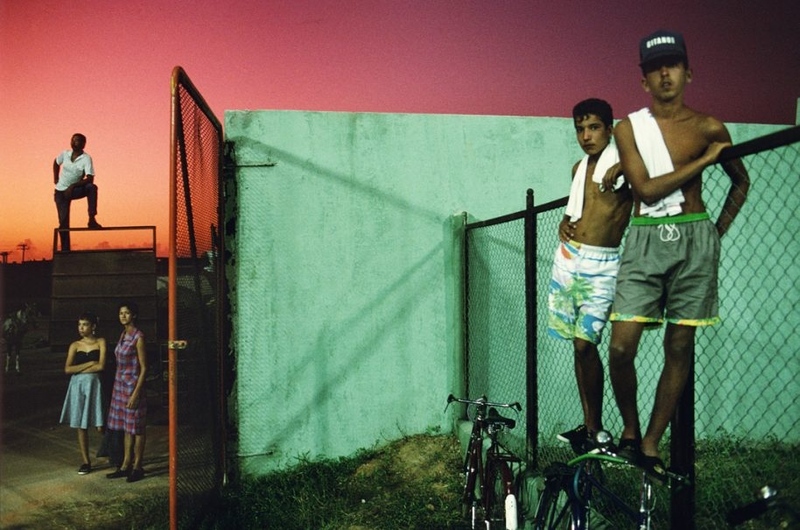 Photo by Alex Webb.